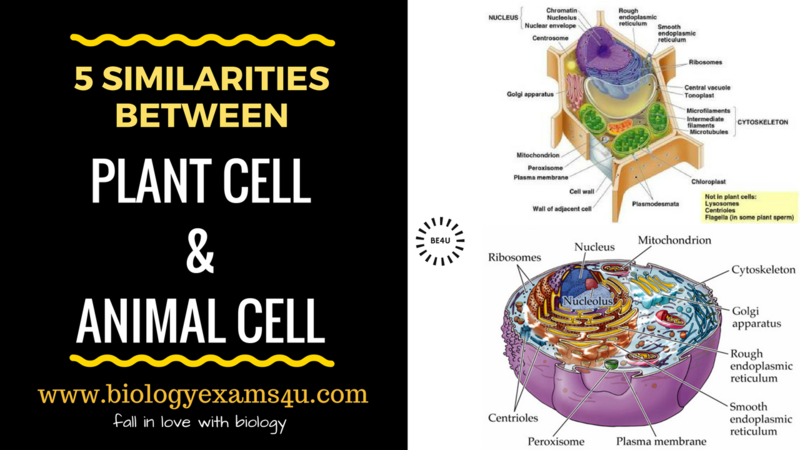 We have already discussed in detail the differences between plant cell and animal cells. Now let us see how these two cell types are similar. 1. Both plant cell and animal cell is Eukaryotic (with true nucleus or genetic material surrounded by a membrane). 3. Both plant cell and animal cell possess a well defined nucleus and cytoplasm, where genetic material DNA is surrounded by a nuclear membrane. 4. Most of the organelles like nucleus, mitochondrion, Golgi apparatus, endoplasmic reticulum etc are present in both plant cell and animal cell. 5. In both plants and animals cells, DNA is double stranded and complexed with histone proteins and proteins are synthesized by ribosomes in the cytoplasm.